House Speaker Paul Ryan had earlier in the day yesterday called "the deal" that Trump struck with Congressional Democrats "ridiculous" and "disgraceful." Yet Trump jumped at the offer from Nancy Pelosi and Chuck Schumer to tie Hurricane Harvey relief to a three-month extension of government funding and increase in the debt ceiling. In other words -- and the short version -- Schumer and Pelosi ate Republican lunch. Besides Schumer and Pelosi, representing the Democrats, who else was there? Trump, yes, but also House Speaker Paul Ryan, Senate Majority Leader Mitch McConnell, House Majority Leader Kevin McCarthy, and Treasury Secretary Steven Mnuchin. All those Republicans opposed the Schumer-Pelosi plan -- one might say, opposed it bitterly -- but Trump ignored them. 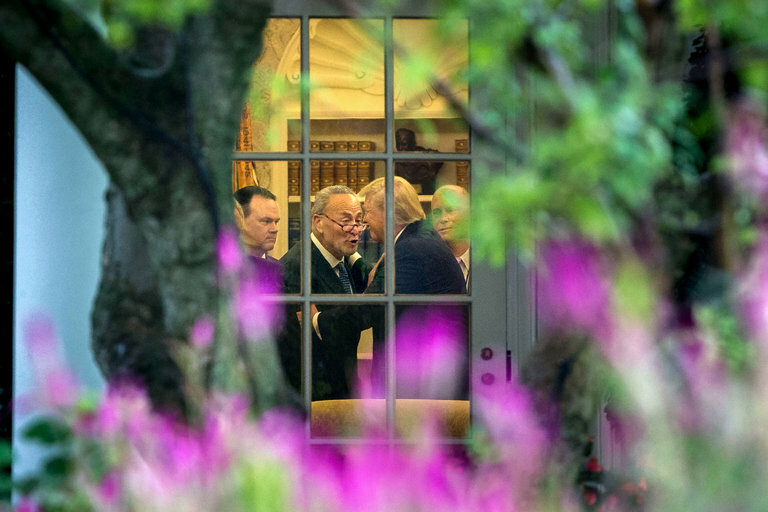 In fact, later on Air Force One, on his way to North Dakota, Trump deliberately praised Schumer and Pelosi for striking a deal with him while not even mentioning the Republicans who were also in the meeting. Schumer and Pelosi now have more than just leverage. Their three-month deal on the debt ceiling will force another painful vote for Republicans around Christmas time, with every chance of political disaster. Paul Ryan had wanted a debt ceiling extension of 18 months, which would have put another vote beyond the 2018 mid-term elections. Trump in effect shat in Ryan's hat. Trump also later talked up the mutual willingness among the Trump-Schumer-Pelosi triumvirate to make the "Dream Act" (DACA) into solid law. Trump now wants the Democrats in Congress to save him from the blowback over his tromping on DACA on Tuesday. Meanwhile, Ryan and McConnell fumed in the corner like jilted spouses in a nasty divorce. The deal struck between the Democrats and Trump still has to go for votes in both House and Senate, and many Republicans are steaming mad about it. “The Pelosi-Schumer-Trump deal is bad,” Senator Ben Sasse of Nebraska tweeted. Representative Mark Walker of North Carolina, chair of the Republican Study Committee, said, “I’m still processing this, but my first instinct is I’m not very happy about it." But can Republicans afford to vote against it? Score one for Chuck Schumer and Nancy Pelosi. Hahaha! Plus this morning Nancy Pelosi called Trump and asked him to tweet the following, which he did: "For all of those (DACA) that are concerned about your status during the 6 month period, you have nothing to worry about - No action!"